I did a review on I've Been Domesticated of Yogurt: Sweet and Savory Recipes for Breakfast, Lunch, and Dinner by Janet Fletcher. No, it's not a vegan cookbook, but I want you all to realize how easy it is to veganize recipes. I've made quite a few things in here, and have liked them all. 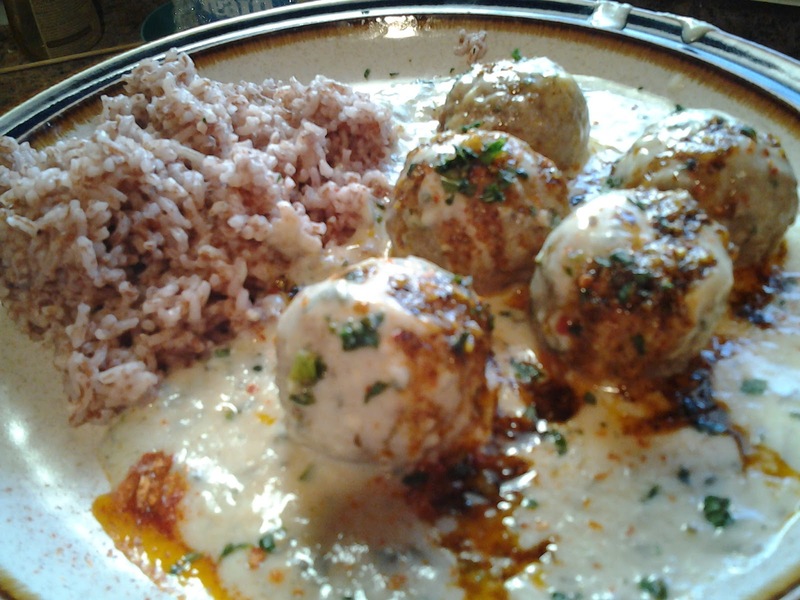 This recipe is a very loose adaptation of her "Lamb Meatballs in Warm Yogurt Sauce with Sizzling Red-Pepper Butter." I served it with Sri Lankan Red Rice. In a bowl, I whisked 2 cups of a So Delicious coconut yogurt with 2 cloves of grated garlic and a small handful of chopped mint (I left out the dill and egg.) Then, after heating a cup of Better Than Bouillion; Vegetable Base , I whisked a 1/2 cup of it into the yogurt mixture, then poured it all back into the skillet. Add the meatballs, along with salt and pepper and heat on medium-low heat until the sauce thickens and the meatballs are heated through (they need to be cooked for 15 minutes). Plate the rice. Plate the meatballs and sauce. Pour the butter sauce over the meatballs. And voila! It looks fancy, but it was a quick weeknight meal. What do vegans eat? The same things everyone else eats, just without all the death and misery.